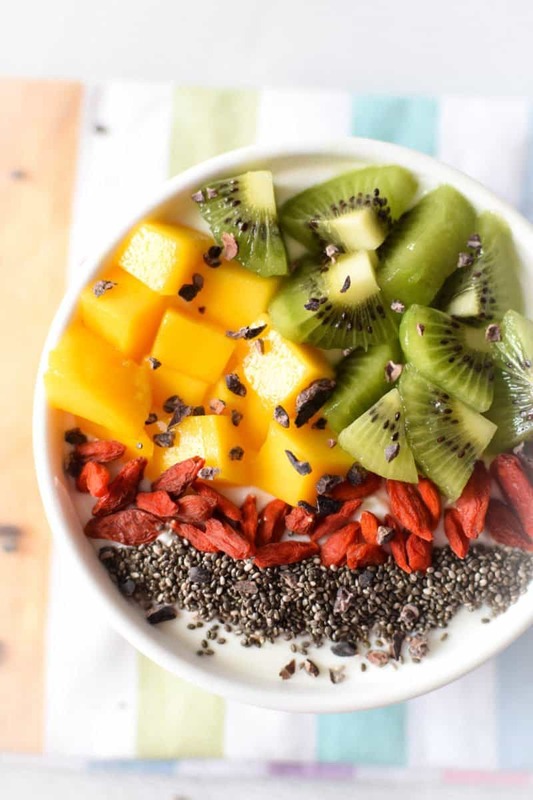 This quick & easy to make Immune Boosting Tropical Breakfast Bowl is packed with nutrition from immune boosting superfoods that are high in vitamins, minerals & antioxidants and good-for-you probiotics. For me – breakfast is non-negotiable. 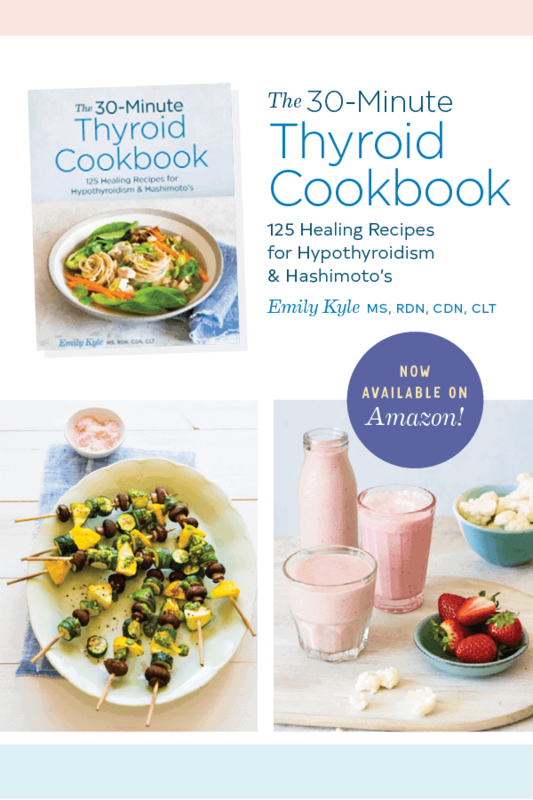 Particularly one that is high in protein and heart-healthy fats. Over time, I have found that I have to eat a high protein breakfast or else I will be starving by noon, and that’s never pretty. This recipe is perfect because it does not take a lot of work to make, it can be ready in less than five minutes you have a delicious and nutritious meal you can take on the run with you. I think we can all agree that food just tastes better when it looks better – right? 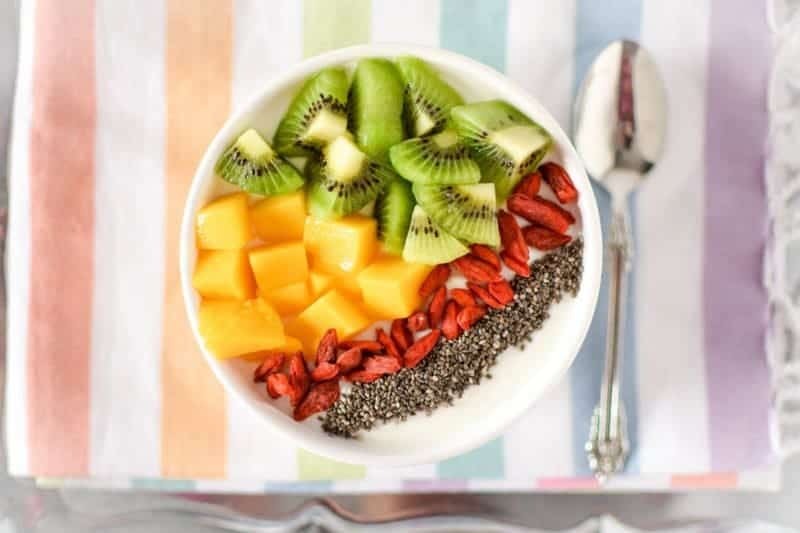 While this Immune Boosting Tropical Breakfast Bowl looks fancy, it is nothing more than yogurt and fruit put together with a little creativity. But don’t worry if you don’t have time for creativity – this tastes delicious no matter how you present it. Plus this bowl is packed with nutrition and immune boosting ‘superfoods’ that are high in vitamins, minerals & antioxidants. One serving of this bowl provides your body with 28 grams of protein, dietary fiber, and healthy omega 3′s to keep you full all morning long. I typically prepare veggie quiche or berry quinoa on Sundays so I have a healthy breakfast all week long, but sometimes Sundays are best spent lazy. 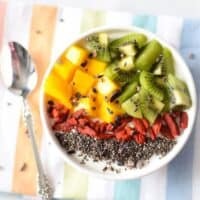 Luckily I can still eat a healthy meal while throwing it all together quickly, and this tropical breakfast bowl is just as healthy as it is delicious. The foundation of this breakfast is plain Greek yogurt which is packed with protein and free of both artificial sweeteners and refined sugars, but if you’re looking to make this recipe vegan just substitute coconut yogurt for the Greek. Traditional Greek yogurt is a great choice because it contains probiotics that can help strengthen your immune system. I already had all of this fruit cut in my refrigerator which makes putting this breakfast together super quick on busy mornings. I always tell the women I am working with that the key to developing a successful happy & healthy lifestyle involves a lot of preparation. My simple tips is to cut all of your fruit when you get home from the grocery store, that way you will always have a readily available snack, or a tasty breakfast like this. Plus all of these tropical fruits are bursting with vitamin C which can help support a healthy immune system, especially during the winter months. 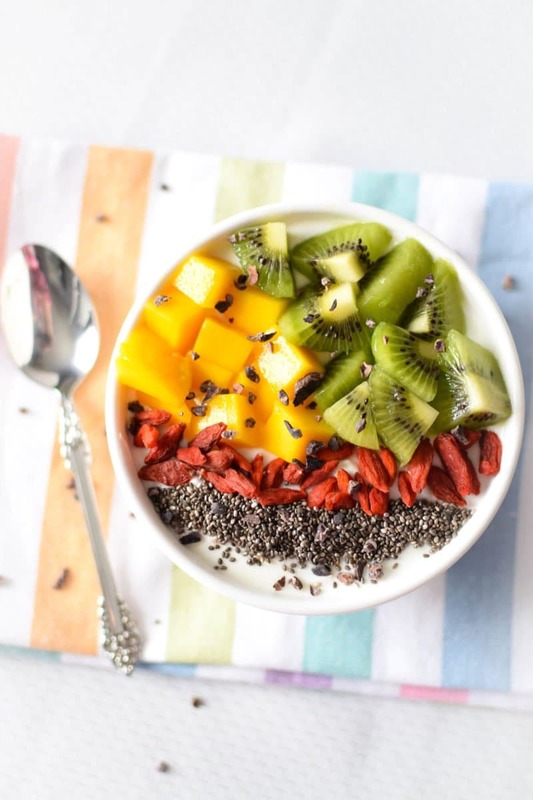 Wake up with a smile on your face when you prepare this Immune Boosting Tropical Breakfast Bowl. 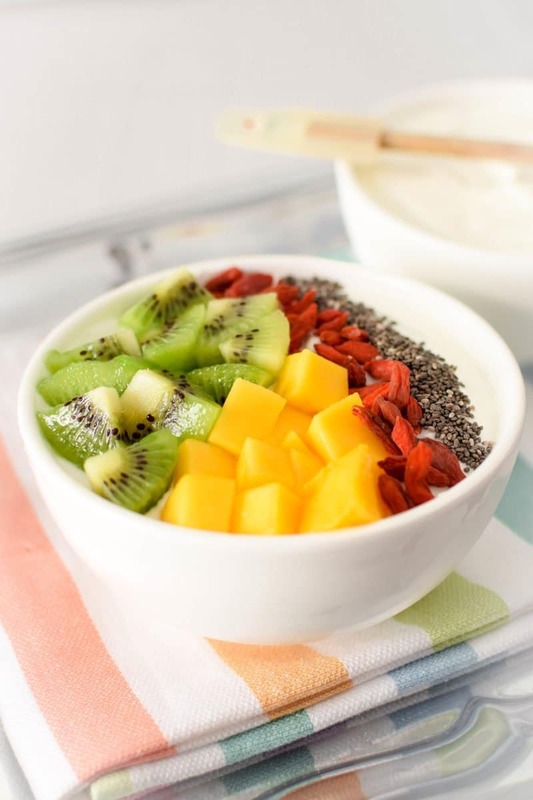 In a large bowl, mix together the Greek yogurt, coconut extract and stevia. Add your fruit and chia seeds. Garnish with raw cacao nibs and gogi berries.